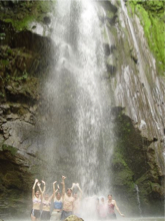 Bosque del Cabo has hiking for both very experienced hikers looking for a challenge and people who just want to take a walk and enjoy nature. 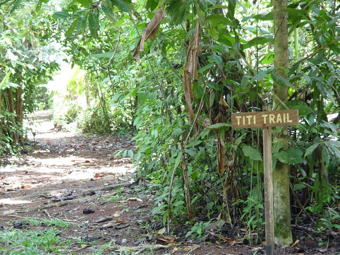 There are many trails that are maintained on the Bosque property, including the Pacific Trail, the Golfo Dulce Trail, the Creek Trail, the Trogon Trail, the Titi Trail, the Saino Trail, the Manakin Trail and the Zapatero Trail. 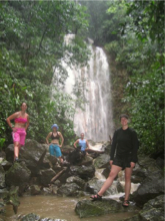 Plus there are other hiking opportunities on our property and in the surrounding areas. You are welcomed to hike them on your own or with a guide. 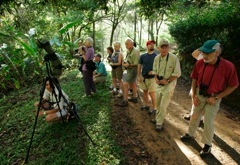 Some of the guided tours offered at Bosque include: Primary Forest Experience, Early Morning Birding & Monkey Tour, Afternoon Birding in the Garden, Sunset Tour, Night Walk and the Lagoon Tour. 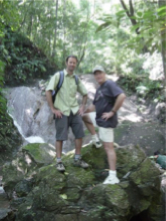 wide array of bird species(over 365 species have been recorded in this area) in the tropical lowland rainforest is between 6:00-7:30am (sometimes the tour goes longer if many birds are spotted). 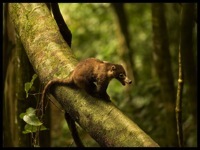 Your guide will lead you around the Bosque gardens and forest areas, where you will see many species of birds, as well as monkeys, butterflies, and small mammals (like coatis and agoutis). 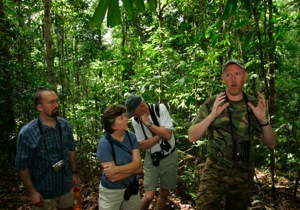 Your guide will explain the various behavioral patterns and interactions of the birds in the area. The tour is enhanced by a Swarovski spotting telescope; binoculars recommended; 1½-2 hours, easy hiking; please arrange the tour the previous evening. Hiking through primary growth forest is to experience firsthand the majesty and diversity of an untouched forest eco-system. 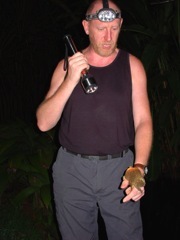 Your guide will introduce you to a variety of tree, plant, and animal species living here. He will also discuss the delicate balance which exists among the inhabitants of this environment. 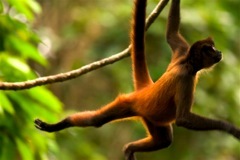 Insects (such as army and leafcutter ants), birds (like tanagers, woodcreepers, and antbirds), mammals (like anteaters, monkeys, and peccaries), and plant life (such as the Shoemaker Tree) are all interdependent and thrive in this environment. 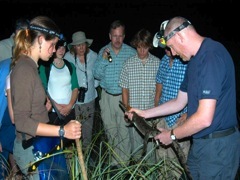 This is a great opportunity to see and learn about the importance of bio-diversity. 4 hour hike, medium difficulty. $30/person. Come and see the many species of birds flying around and through the garden as they prepare for nightfall. One of the best times of day to see birds and wildlife is late afternoon. What better way to see birds than in our upper tropical garden with our bird specialist pointing out the various species flying in and out of the garden from the surrounding rainforest? 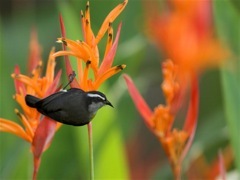 We have planted many trees, bushes, and flowers that attract birds (particularly hummingbirds) and butterflies. A gentle preamble to dinner around the Bosque grounds. A large variety of wildlife in a short space of time. 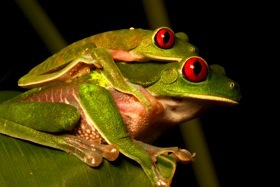 Bats, spiders, frogs, toads, snakes, and lizards all regularly seen. Your guide will tell you about some fascinating modes of life. A visitor’s favorite, generates much conversation over the evening meal and a tour guaranteed to reveal many night creatures for your viewing delight. Before dinner, after the sun has set we begin the tour; 1 hour, easy walk; need flashlight. $20/per adult - children under 12 years old $15/child. This tour is not regularly offered, but it can be set up on a private tour basis. Please talk to reception/guides directly to discuss this tour.